Negligence in the workplace occurs for a variety of reasons and can lead to property damage, loss or theft, and injury, illness or death. Negligence happens casually as well as formally, with the latter leading to legal violations that can result in fines and lawsuits. Understanding common examples of negligence at work will help you avoid them and determine if you’ve been a victim. It’s up to a business to keep its employees’ customers’, vendors’, suppliers’ and contractors’ personal and business information secure. For example, if employers conduct credit and criminal background checks on employees, it should destroy the paperwork when it’s longer needed, or take steps to ensure the information does not become public. If a business stores customer credit card and social security numbers, it must take steps to keep those safe from hackers. Businesses should also take basic steps to keep customers and employees safe on site, such as providing lit emergency exit signs, fire extinguishers and adequate lighting in parking lots. If a business does not properly check out an employee before hiring and the employee harms others, the business can be held liable for their actions. For example, a restaurant that hires an executive chef should verify all previous employment, certification credentials and current professional memberships. If the chef makes repeated cooking mistakes that cause health problems for customers, the restaurant would probably be liable because it did not conduct a basic employee background check. This is one reason why criminal background checks are common -- if an employee attacks co-workers and customers and they can prove a criminal background check would have shown prior violent behavior, this could be construed as negligence on the part of the employer. If an employer is aware of an employee’s dangerous, erratic or unprofessional behavior and doesn’t terminate the employee, the employer might be found liable for being negligent in protecting others’ safety. Premises liability cases involve businesses that are negligent in keeping customers and workers safe, such as not maintaining walking areas, stair hand railings, electrical infrastructure and storage areas. 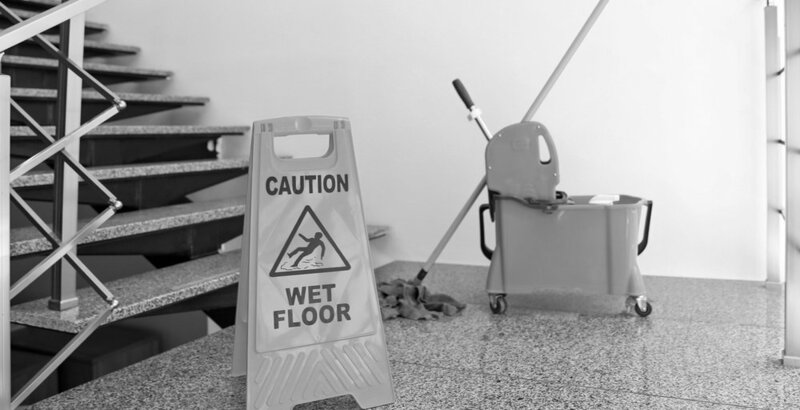 The most common form of premises liability is the slip-and-fall case, often resulting from negligence such as placing electrical cords along floors or not leaving caution signs on wet floors. Product liability cases involve accusations that a business is negligent in the research, design, production, advertising or packaging of a product.